Here’s our first peek at Alchemy Properties’ upcoming mixed-use condominium development NOMA. 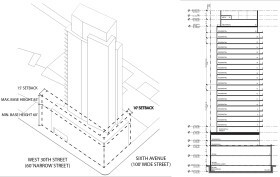 Slated to rise 26 stories/316 feet from a 7,000-square-foot corner lot at 846-850 Sixth Avenue, the building will be the first ground-up condominium development in NoMad west of Fifth Avenue. With demolition just wrapping up on a single-story strip of retail stores, excavation will soon begin for a FXFowle-designed mixed-use tower that is slated to house 52 condo apartments and 13,000 square feet of retail space on its first two floors. Zoning diagrams filed at the Department of Buildings indicate the form of the tower will be composed of variously scaled and skewed interlocking volumes. Units with eastern exposures will have balconies.